We’ve all been there: you are parking, and you feel the rims of your vehicle brush up alongside the curb. The results are scrapes and scratches to the metal rim which are known as curb rash. Although curb rash may look permanent, it can actually be fixed with a little effort and know-how. Here’s how to do it. Begin by removing wheel and tire so you can work with rim easily. You will begin by using 80 grit sandpaper to sand down any areas that going to get filled by the bondo body filler. 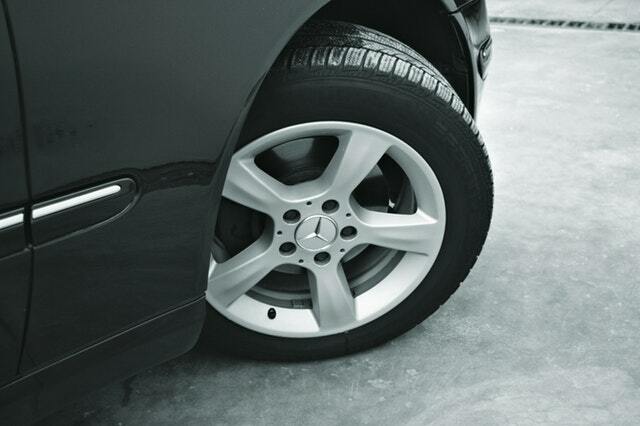 You especially want to be sure to remove any dirt or grime that is caught inside the curb rash and scratches. Make sure you get down to bare metal in those areas. Wipe the whole wheel down with rubbing alcohol until completely clean. Mix bondo filler with liquid hardener. You will have about 5 minutes to mix and apply the bondo before it hardens. Make sure you mix the two in a way that doesn’t cause air pockets. Use pressure to force the filler into the damage. Build it up in the shape of the rim. Don’t worry if you overdo because we’ll sand it down later. Let bondo dry for about 20 minutes. Now take the 80 grit and sand bondo filler until completely smooth with the rest of the rim. Feel for any bumps and sand them down until smooth. Now you can jump down to 320 grit paper to smooth everything further. Wipe and clean the wheel thoroughly to prep for primer. For the first coat, make sure it is light and even. Apply a second thicker coat and then a third coat. Should have complete coverage. An hour and a half to dry. Wet sand with 600 grit. Clean again with alcohol. Now apply the color that matches original. Multiple light coats are the optimal technique. Let dry for 30 minutes and apply a clear coat to seal in the paint and resist chips and corrosives. Dry for at least an hour. You can now replace the tire and reinstall wheel to your vehicle. You should have a perfect, factory-fresh-looking wheel now.